Hundred variable types of rambutan collected from major rambutan growing tracts of Kerala were evaluated for various qualitative and quantitative traits in addition to sensorial perception with the prime objective of recording the existing variability and genetic wealth available in order to select and conserve the superior types. The study confirmed that rambutan collections varied widely in their physico-chemical traits and most of the traits showed the coefficient of variations above 20%. Clustering of rambutan collections based on qualitative traits using dendrogram gave rise to ten distinct clusters at the similarity coefficient status of 60%. The principal component analysis performed based on tree characters revealed the major contribution of leaflet length, leaflet width and petiole length towards the genetic divergence in rambutan and about 75% of the total variance in fruit characters was mainly determined by the traits such as fruit weight, aril weight, aril thickness, seed weight, seed width, titrable acidity, TSS and sugar content. Clustering based on principal components revealed the superiority of seventeen collections over others, which can be out-rightly recommended for cultivation. In the sensory analysis, Col.061, Col.021 and Col.042 were most preferred by panelists because of their better fruit weight, taste, juiciness and easy detachment of aril from seed. 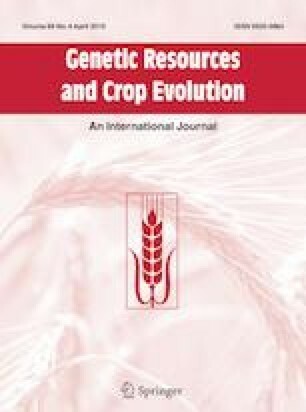 This study recorded the extent of divergence of rambutan types grown in Kerala which opens out great scope for selection and facilitates further crop improvement programme in rambutan. There is an urgent need to standardize the management practices including the varietal wealth in rambutan by using these genetic resources. This research was fully funded by Kerala Agricultural University, Thrissur, Kerala. The facilities, help and advice of KAU faculty and the award of KAU Junior Research Fellowship to the first and third author are sincerely acknowledged.